Regatta baselayer - an integral part of any outdoor clothing kit. 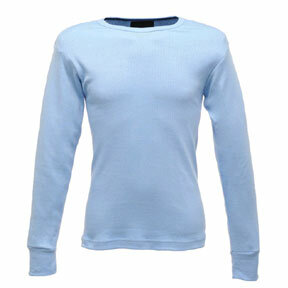 Outdoor Look has a great selection of cheap base layer, view our range below. A Regatta baselayer keeps you warm and light in tough conditions. We buy in bulk and pass the discounts onto you. Regatta Baselayers offer that essential first level of protection against the cold that gets the job done. Featuring sets and individual item there is something to satisfy all the requirements for workwear. In addition, great for all those outdoor pursuits, whether tackling the mountains in winter or attempting to keep warm whilst out cycling, the Regatta baselayer offers both thermal qualities to keep that much needed warmth in and at the same time is quick drying so that it can be worn day after day. Whether it’s the Ladies Base Long Sleeved T-Shirt or the Regatta L/S Base T-Shirt for Men, both are made from Hydro-Therm polyester giving both warmth and that special lightweight fabric, so can be worn all day as the first layer of your outdoor clothing with the lightweight fabric being comfortable when worn next to the skin. Then there is no excuse for not starting your kit right with possessing the right baselayer. So when you look at adding this to the excellent customer service we offer and the free delivery options, it’s not difficult to add a baselayer when making your choice from the free catalogue containing all the top brands at discounted prices.